Flavius Claudius Constantinus was the eldest son of Constantine I the Great and Fausta. Constantine II was born in 314 AD and was given the rank of Caesar in 317 AD when he was obviously very young. Nonetheless, Constantine II appears to have inherited at least his father’s ambitions. By the age of eighteen, Constantine II had already distinguished himself militarily in a campaign against the Goths. Following the death of his father, Constantine II was perhaps the main instigator in what has become known as the “palace massacre” during which most family members born of his step-grandmother Theodora were murdered. Few were spared and those were only due to their extreme young age, particularly the future Emperor Julian II. Constantine II thus inherited Spain, Gaul and Britain as his portion of the Empire in 337 AD. 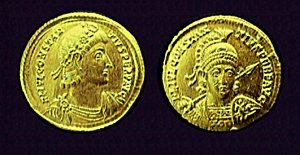 However, Constantine II was not happy with his share and soon invaded the territory ruled by his younger brother, Constans. Constantine II crossed the Alps and invaded Italy in 340 AD. He was killed in an ambush near Aquileia.